Featuring thousands of brightly coloured and exotic fish, the Barcelona Aquarium is a must for children of all ages. With 35 different tanks holding creatures from different oceans, the aquarium is the largest of its kind in Europe and features species such as giltheads, moray eels, sunfish, rays, sand tiger sharks and sandbar sharks. 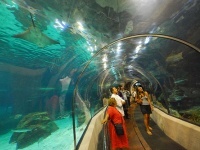 The Oceanarium is the largest Mediterranean-themed aquarium in the world and the showpiece of the Barcelona Aquarium, with a transparent tunnel winding through it that gives visitors the exhilarating feeling of walking underwater. The whole aquarium houses about 11,000 organisms from 450 different species. The best time to visit is during feeding times: scuba divers feed the sharks on Monday, Wednesday and Friday between 12pm and 1pm; the entertaining penguins are fed twice daily, on weekdays at about 1pm and 5pm, and on weekends at about 1,30pm and 5pm; and the rays are fed between 1.30pm and 2pm every weekday. The aquarium offers scuba diving and cage diving activities for an extra cost. A fun outing for the whole family, the Barcelona Aquarium provides a welcome break from traditional sightseeing in the city. Opening times: Open Monday to Friday from 9.30am to 9pm; Weekends and public holidays from 9.30am to 9.30pm; in June and September until 9.30pm, and in July and August until 11pm. Admission: €20 (adults); €15 (children aged 5 - 10); €5 (children aged 3 - 4). Concessions available.